Recently, my sister, Kerri, and I spent a day in Birmingham where we enjoyed lunch at a wonderful place called Brick and Tin. Brick and Tin is located in downtown Birmingham on 20th Street North. There is also a second Brick and Tin located in nearby Mountain Brook, but on this day we headed to the original 20th street location. Brick and Tin is housed in building constructed in the early 1900's, which began life as a shoe store. The chef/owner of Brick and Tin is Mauricio Papapietro, who happens to have been associated with two of Birmingham's premier chefs, Frank Stitt and Chris Hastings. The name of the restaurant was decided when the remodeling of the old building was taking place. As sheetrock and ceiling tiles were removed, brick walls and a pressed tin ceiling was revealed. Voila...Brick and Tin! The concept and philosophy for Brick and Tin is one of locally sourced, farm to table, simply prepared food. As the Brick and Tin web page states: At brick & tin we believe that people should know where their food comes from. Since most food consumed by Americans these days travels hundreds or thousands of miles before making it to a hungry mouth, we have carefully sourced our ingredients from purveyors as close to home as possible. We also believe that it is important for people to enjoy food that is free of hormones, chemicals, or other additives. Meats prepared here are humanely raised in pastures and free roaming ranges. Our purveyors are serious enough about this to pursue and obtain animal welfare certification. We care about our local farmers and support farming that is responsible and sustainable. By doing so, we may help ensure that future generations can share in the same bounty you find before you. As we entered through the front door, we noticed a line had formed in front of the bar, so we joined in. While waiting to place our orders at the bar, we studied the menu. It all sounded wonderful...soups, salads, sandwiches, desserts. 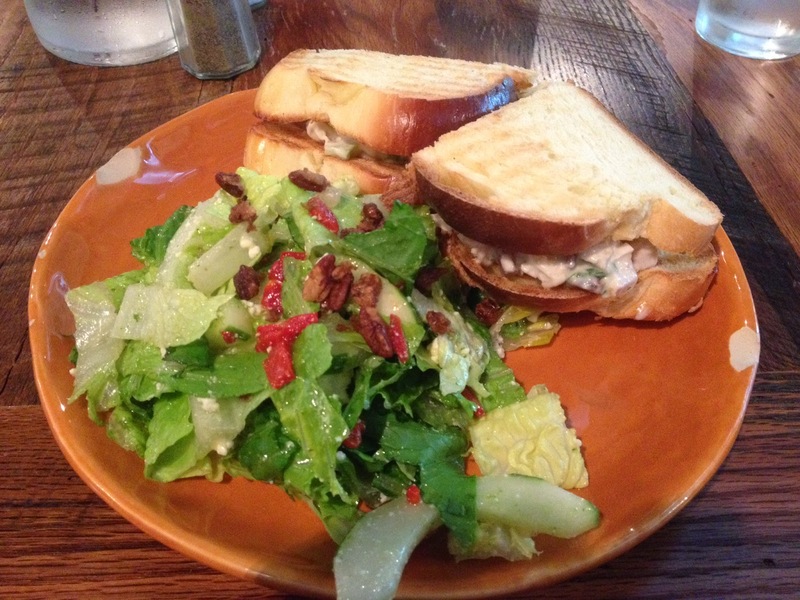 When our turn to order came, Kerri selected the Southern roasted chicken salad sandwich with a classic side salad. The chicken salad had celery for a nice crunch and toasted pecans on homemade challah. The salad was beautifully green and fresh with more toasted pecans. I chose the slow roasted beef brisket sandwich with caramelized onions, white barbecue sauce and corn chowder. While I would not have called it chowder because I typically think of chowders as being chunky and this one was smooth, more like a bisque, the soup was still very good. I would have been happy with just the corn chowder. The braised beef brisket was fall apart tender and, of course, being from Alabama, I loved the white barbecue sauce! Both of our sandwiches came on bread baked right in the restaurant's bakery and both were delicious. I snuck back to the bakery to check out all the varieties of bread and discovered cookies, too! We loved the cold bottle of water the waiter brought to our table. It really is the simple things that set places apart! For dessert we shared a chocolate bread pudding topped with fresh whipped cream. It was marvelous! When we finished, that bowl was empty! We could not leave empty handed! My sweet sister bought me a box of cookies, even though she said she would never have picked out the flavors I chose. She isn't big on herbs in her cookies, which I don't understand at all! My three choices were Mexican Hot Chocolate with a pinch of hot pepper, Black Currant Rosemary, which was my favorite and White Forest made with white chocolate, of course! All of the cookies were delicious. Brick and Tin will definitely be on my list of places to revisit when I am in Birmingham. I loved everything about it from the rustic/institutional city loft feel to the great food and great service. Three Friends and a Fork give Brick and Tin 3 Wholesome Yums UP!